My friend Maureen gives me a wonderful gift for the December 1999 holiday: A day of snorkeling with manatees and drift scuba diving at Rainbow River. Our adventure starts just after work between Christmas and new year's for the new millennium. While the rest of the nation is shivering in bitter cold, snowy weather, we are off to swim in two central Florida rivers. Our first stop is the sleepy town of Brooksville, where we stay at a bed and breakfast. The Verona House Bed & Breakfast is a Sears Roebuck Co. Catalog House. The Verona model came to Brooksville in two box cars in the spring of 1925, which happens to be the same date that my Gainesville bungalow house was built (which explains why I notice the bedroom window frame looks very similar to my frames). The house is a two-story Dutch colonial home, which was precut and ready to assemble. It also included a 76-page instruction booklet so that it could be assembled. I do not know if batteries were included...but it was a lovely house with very pretty wood floors. Lot's of character and cozy charm that made it seem handcrafted. The next morning, we are treated to a pleasant breakfast, and then drive north to Crystal River-a 30-minute drive. Our snorkeling is in King's Bay in the headwaters of Crystal River. The bay is fed by about 30 crystal clear springs, and is found within the Crystal River National Wildlife Refuge established in 1983. Spring water feels chilly in the hot summer months, but because it is 72 degrees year round, it feels warm and attracts manatees during the winter months. The springs pump out 600 million gallons of pure spring water each day. We are taken out on a pontoon boat with a small group. That morning, the air temperature is 40-50 degrees, so I am, at first, tentative about getting into the water. But because of the chilly air, the spring water feels like bath water-especially with my new full wet suit on. We quietly and effortlessly float around, and are joined by a few of the very gentle manatees. We are able to approach each of them to pet and stroke and scratch them. They enjoy it so much that they roll over so that we can scratch and rub their bellies. Their skin feels leathery, and much of it is covered with a thin layer of slick green algae growth. Manatees can weigh as much as 1,500 to 2,000 pounds, but they are so gentle and slow that it is easy to see why they are also known as "sea cows." Approximately 20 percent of the manatees in the U.S. use the Crystal River Refuge for habitat. The manatee is still considered endangered. The main threat, besides boat propellers, is loss and degradation of their habitat along the coasts. Next, we are taken to King's Spring in King's Bay. Along the way, I notice that the shorelines are crowded with homes built along the water's edge-one of which has a concrete driveway that ends abruptly at the seawall, making us wonder if anyone had ever accidentally driven off the edge. We also notice the cooling towers for the Crystal River Nuclear Power Plant looming off in the horizon. Several snorkelers are gathered at the popular King's Spring site, where we are able to enjoy playing with 6-8 additional manatees. 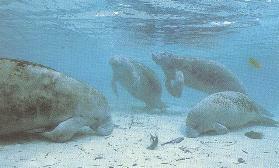 At one point, a family of 3 manatees-mom, dad and baby calf-float by us. In this location, we are also swimming within an enormous school of yellow-tailed jack, and a few sheepshead fish. All in all, it is about 2 hours worth of very enjoyable snorkeling with the manatees. Next, a Crystal Lodge dive boat meets us at Rainbow River-about 30 minutes northeast of King's Bay-where we are signed up for a drift dive. The boat takes us upstream along this very colorful, bright blue river. Here, we don our scuba gear for a drift dive. It was approximately 90 minutes of effortless drifting, because we are carried along by the strong current of the river. During our dive, which goes as deep as 21 feet, we enjoy sugar white sandy bottoms, investigating spring boils-many of which are pumping out a strong force of water that made it hard to look into the vent without holding on to rocks at the mouth of the vent. The river bottom has a rich growth of sea grasses, and at one point, as we are told before the dive, we see a large school of alligator gar fish-some of which are quite long and large. Apparently, this school can always be found at this spot in the river. In sum, the snorkeling and diving we enjoy this day can best be described as very gentle, peaceful, pleasant experiences. I highly recommend it.